Clouds are subdivided into varieties based on how the cloud elements are arranged and their transparency on the sky. There are nine cloud varieties and perlucidus clouds are one of them. How does this cloud variety look like? In what cloud genera does it appear? How common does this cloud occur? To learn the answers to these questions, read on. Perlucidus clouds refer to cloud formations appearing in extensive patches or layers with distinct small gaps in between the cloud elements to allow higher clouds, blue sky, sun or moon to be seen through the gaps. Perlucidus clouds may appear in association with other cloud variety such as translucidus and opacus and occur when there is an upcoming warm frontal system. This cloud only occurs in stratocumulus and altocumulus clouds. Although perlucidus doesn’t produce rainfall by itself, it sometimes brings light showers or drizzle. This form of altocumulus cloud is very common and aoppears with small spaces between the elements which make higher clouds, sun or moon visible. Altocumulus perlucidus abruptly appears and invades the sky quickly. It is usually seen when there is an advancing low pressure system. Stratocumulus clouds in this variety have small gaps with irregular patterns that allow the overlying sky or sunlight to shine through. At What Height is Perlucidus Clouds Found? This cloud variety is found at low and middle atmospheric altitudes ranging from 6,500 feet to 25,000 feet above the Earth’s surface. It can be made up of water and ice crystals especially when found at higher elevations. How do Perlucidus Clouds Form? 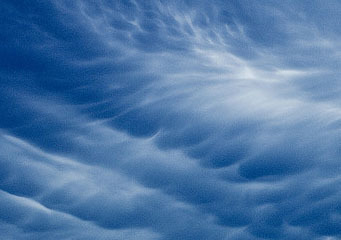 Perlucidus clouds form as a result of convection at the previously unbroken cloud layer. This happens as a result of an advancing region of warm air into a section of cool air due to an upcoming low pressure system. The advancing low pressure system induces warm air to rise to an area where the air is cooler. If the winds travel northeast to south little by little, then rainfall should be expected within the next 10 to 20 hours. What do Perlucidus Clouds Look Like? Perlucidus cloud appears in the stratiformis species. But what does this mean? Clouds in the stratisformis species are spread out in wide horizontal layers or sheets and have distinctive small gaps, spaces or openings in the cloud layer that lets you see the overlying clouds, sun, moon or blue sky above them. How common are Perlucidus Clouds? These clouds, which are commonly seen anywhere in the world, indicate the gradual lifting of cloud layer due to an upcoming low pressure system. So when you observe that the clouds in the sky have small, irregular gaps that make the heavenly objects above them visible, perlucidus clouds are invading the sky, thus indicating that there is an upcoming low pressure system.